Liverpool are favourites to maintain their winning start to their Champions League group campaign as they face a tricky trip to Napoli on Wednesday night. Last year’s finalists left it late to secure three points against PSG in the opening set of fixtures, while Napoli got off to a disappointing start with a 0-0 draw away to Red Star Belgrade. Napoli boss Carlo Ancelotti has mixed memories of facing the Reds in this competition, being in charge of AC Milan when Liverpool beat them on penalties in the 2004/05 final, a loss he overcame two years later when Milan beat Rafael Benitez’s side 2-1 in Athens. Indeed, Ancelotti has never actually lost to Liverpool in 90 minutes (W3, D1) in this competition, with that memorable 3-3 draw and penalty shoot-out in Istanbul the only time he hasn’t beaten the Premier League side in his four attempts as a manager on this stage. All that is irrelevant when he meets Jurgen Klopp’s side as Napoli boss at Stadio San Paolo on Wednesday night though, and the hosts go into the meeting as slight underdogs (around 5/2 with the best bookmakers). In Liverpool, Napoli are coming up against a side who last season scored 20 goals in six away games in the Champions League amid a run to the final. That feat is matched only by holders Real Madrid, who achieved the same tally en route to lifting the trophy in 2013/14. If Liverpool’s rampant away form wasn’t enough cause for concern to Napoli already, the Serie A side are on a poor run in Europe’s premier club competition, winning only twice in their last nine Champions League games (W2 D1 L6). Betway and Bet365 offering a solid 23/20 on an away win. That said, more often than not Napoli find the net in Europe – their stalemate with Red Star last time out was only the third occasion they’ve failed to find the back of the net in 29 Champions League games – so Liverpool may not have it all their own way. The best price on both teams to score is offered by William Hill at 4/7, but given Liverpool’s momentum in this competition, the best value lies in backing an away win with both teams finding the net. Ladbrokes and BetVictor both offer an inviting 13/5 on that outcome. Much has been made of Mohamed Salah’s indifferent form so far in the 2018/19 season, although the Egyptian does have a decent return of three goals in eight starts. The 26-year-old seems a victim of his own success, but in truth he was never likely to carry his record-breaking form of last season into the new campaign. Although he’s getting into the right areas and finding opportunities – with an average of 4.1 shots per game in the Premier League this term and having had two in Liverpool’s 3-2 win over PSG – his clinical touch has deserted him so far this term. Although Unibet and BetVictor offer tempting odds of 19/5 on Salah opening the scoring, it’s difficult to make a case for him, particularly given the form of Sadio Mane, Roberto Firmino and even Daniel Sturridge. Speaking of Firmino – Liverpool’s match-winner against PSG in the opening fixture – there is no better candidate to back in the goalscorer markets. Often praised for his team-work in creating openings for others (seven assists in 14 Champions League appearances for Liverpool is testament to that) the Brazilian is as deadly as he is creative. He’s managed 11 goals to supplement those seven assists in the Champions League, meaning he’s been involved in an impressive 18 goals in just 14 games at this level in a Red shirt. Those statistics are too strong to ignore, so consider BetBright’s 6/1 price on Firmino to open the scoring. To minimalise the risk, punters may prefer the 2/1 about the Brazilian scoring at any stage, available with 888Sport, while William Hill go 9/1 on Firmino scoring two or more. Meanwhile, Firmino’s understudy Daniel Sturridge is enjoying a new lease of life and may feature from the bench in the second half. The former England international is 11/2 to score last with Unibet. 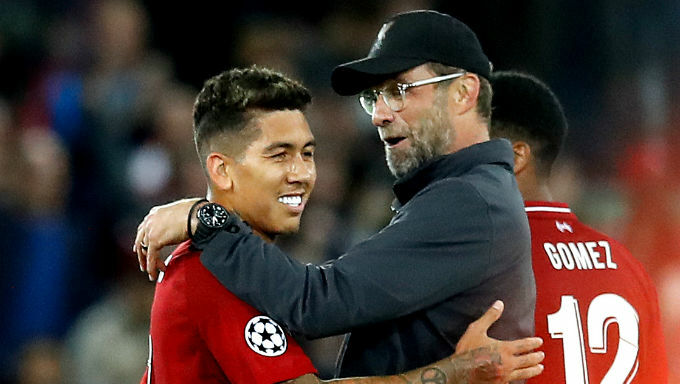 Although getting to back-to-back finals is a big ask of Jurgen Klopp and his side, punters may be surprised to see Liverpool as fifth favourites in the early betting on the Champions League outright market. At a best price of 8/1 with Ladbrokes, Bet365 and Paddy Power, their odds look considerably more appealing than 11/2 favourites Manchester City, whose home form in the competition is a concern following three consecutive defeats at the Etihad in Europe. Barcelona, who have failed to impress domestically following three La Liga games without a win, are a shorter price than 6/1 too, though Juventus and Bayern Munich – around 7/1 apiece – look strong and could well get in the way of the Reds’ route to the final.